Maxillary (upper) canine is the second most common impacted tooth. The first most common impacted tooth is wisdom tooth (third molar). Upper canine is considered the most important tooth for both appearance (look) and function (occlusion or bite). Different types of teeth are designed for different purposes. For appearance, the most important teeth are the upper canines and incisors. For an ideal smile, the lower teeth should not be shown. The canines are the most powerful teeth for biting. The upper canines have the longest roots. The incisors are designed for incising, but they are weak for biting. The molars are designed for chewing. Relatively, the premolars are less important; thus, they are often sacrificed when teeth must be extracted for orthodontic treatment. Canines are the corners of the mouth. Impacted canines must be saved if possible. Only in rare situation, an impacted canine may be considered for extraction. Various factors that influence the decision must be evaluated thoroughly. The best tool for evaluating the status of the impacted canine is the CBCT (3D CT). With this three-dimensional (3D) tool, the orthodontist (or dentist, or oral surgeon, or any dental specialist) would be able to see the exact status of the impacted canine in question. With the information provided by the CBCT, the surgical exposure of the impacted canine can be planned and executed precisely and accurately. Thus, the surgical exposure can be performed with the shortest amount of time, with minimal bleeding and discomfort. Since CBCT provides the orthodontist with details of the bone surrounding the impacted canine, most surgical exposures of impacted canines require only local anesthesia. Thus, this procedure can be done by an able orthodontist, without the help from a periodontist or an oral surgeon. For the following cases, all the surgeries were performed by Dr. Hung Vu himself. With impacted canines, the following considerations are important: surgical, periodontal, and orthodontic. There are differences in the surgical management of the labially and palatally impacted canines. In addition, there are different methods of attachment to the canine (right after the surgical exposure) for orthodontic forced extrusion. 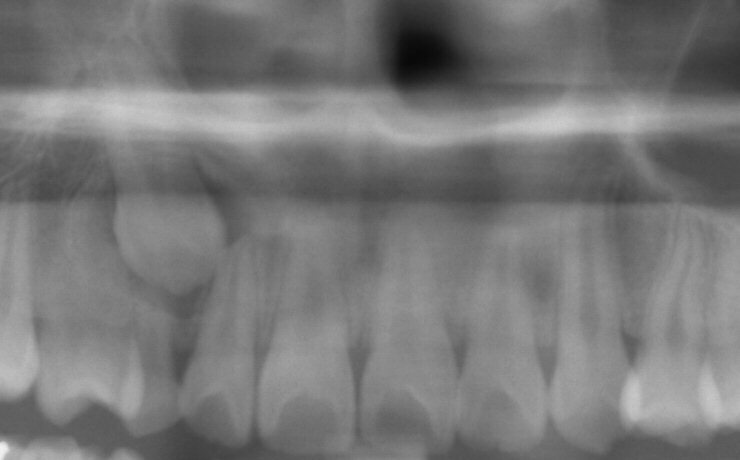 The following is an example of the surgical exposure and forced eruption of impacted canines. 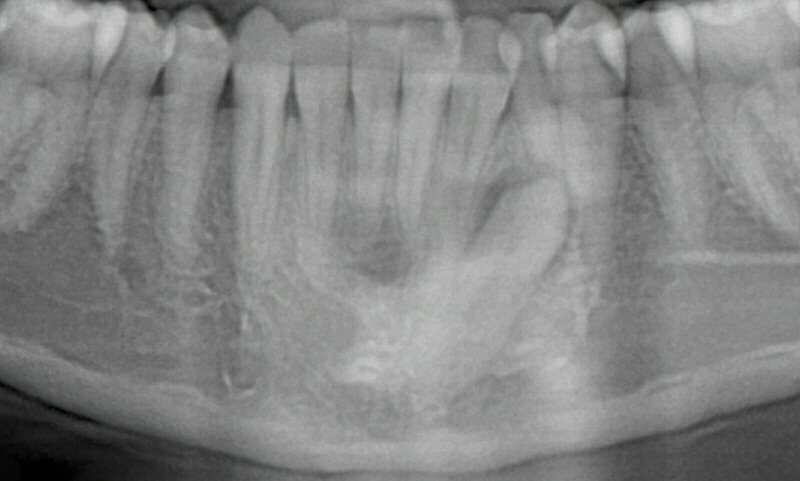 Case 1- Labially Impacted Upper Left Canine 14 y.o. 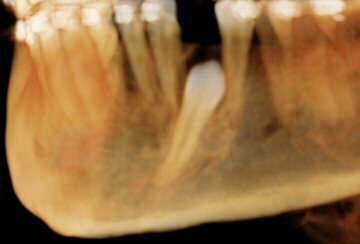 female, laser surgical exposure and forced eruption of impacted upper left canine. This surgery was done prior to the purchase of the CBCT machine. The initial status of the impacted upper left canine are shown in Figs. 1 & 2. 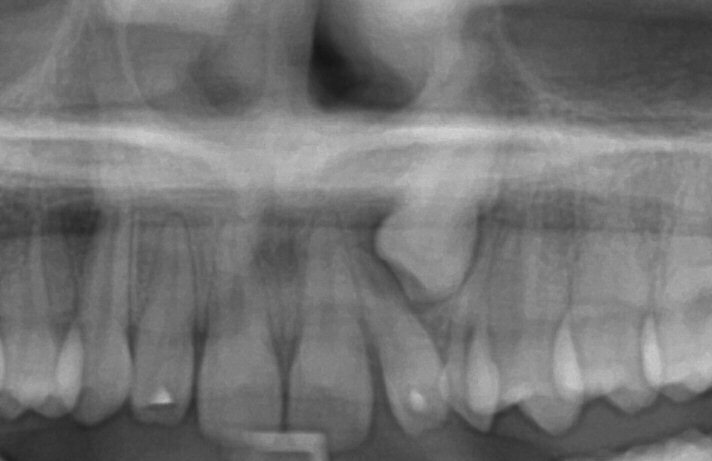 Without surgical exposure and forced eruption, there was practically very little progress with natural eruption of the upper left canine for nearly 2 years (not shown). With the surgical exposure (laser -> no bleeding) and forced eruption, the progress can be seen almost immediately - within a month (Figs. 3-5), and a complete success in four months (Fig. 6). The initial status of the impacted upper right canine are shown in Figs. 7 & 8. Without surgical exposure and forced eruption, there was practically very little progress with natural eruption of the upper right canine for nearly 3 years (not shown). With the surgical exposure (laser -> no bleeding) and forced eruption, the progress can be seen almost immediately - within a month (Fig. 9). After 2 months, the crown is more visible: part of the crown can be seen clearly (Fig. 10). After 8 months, the crown is moved into the position (Fig. 11). With additional 3 months, the crown is relatively well leveled and aligned (Fig. 12). It takes longer to treat the palatally impacted canine. The status of the impacted lower left canine (before orthodontic treatment) are shown in Figs. 13 & 14. Fig. 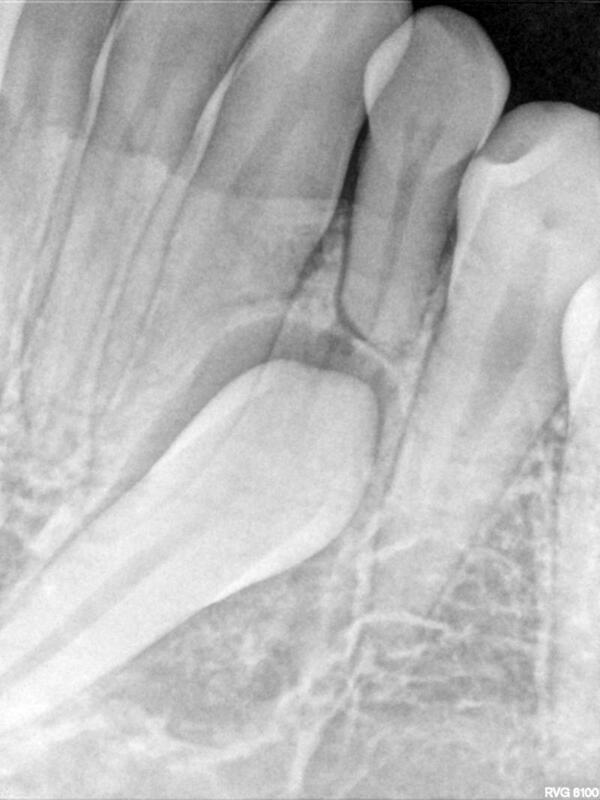 15 Initial photograph of impacted lower left canine - unerupted (at 16 y.o., with existing deciduous canine). Without surgical exposure and forced eruption, there was little progress with natural eruption of the lower left canine for nearly 2 years. Patient and her mother wanted to try without surgery first, and finaly decided on the surgery option (after 2 years). CBCT provides us with the information such that we can perform the surgical exposure of the impacted canine accurately and precisely. We need to know the location of the center of the surgical site and how much bone that must be removed without touching the crown of the tooth (see Figs. 16-18). The numbers shown are the exact measurements, but the surgical doctor can deviate from those a bit (~0.25 mm). Fig. 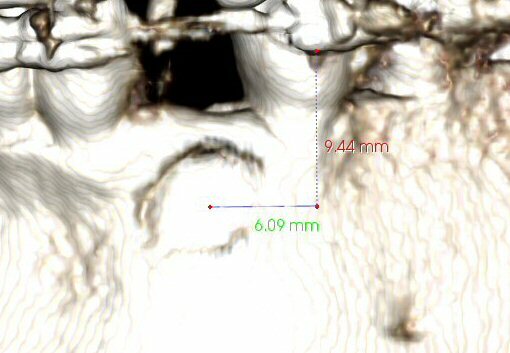 17 CBCT, showing location of center of surgical site: ~ 9 mm down (from bottom of bracket on LL4), ~ 6 mm left (of viewer). Fig. 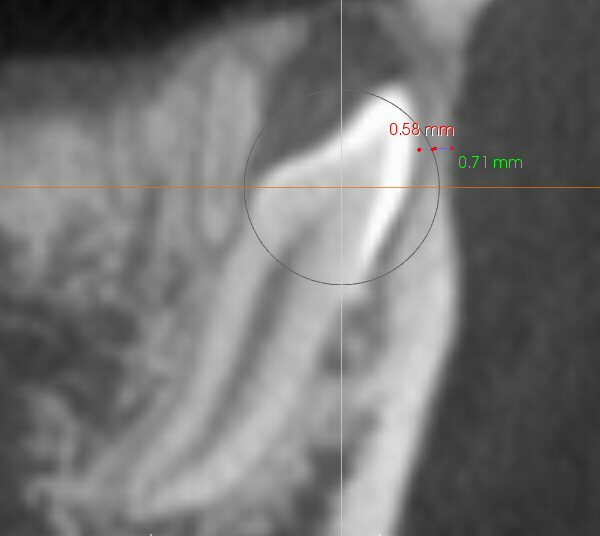 18 CBCT, showing ~ 0.7 mm of cortical bone that must be removed, with ~ 0.6 mm space before touching the crown. With the surgical exposure (a diode laser for soft tissue, a round bur for bone; practically no bleeding, same day) and forced eruption - immediate pulling (gently), the progress is expected to be seen rapidly (Fig. 19). In the 1st post-op visit (2 days after the surgery), healing is seen in progress (Fig. 20). In the 2nd post-op visit (2 weeks after the surgery), the pulling is activated. The force exerted in pulling can be estimated from the shape of the hole of the color tie (Fig. 21). It deforms from a perfect circle (unstretched) to an approximated ellipse (stretched); shown by the blue arrow. The figure also shows improved healing. Fig. 21 Second post-op visit, 2 weeks after surgical exposure; activated pulling (progress, improved healing)© Copyright 2007-2014, Vu Orthodontics. All rights reserved. In the 3rd post-op visit (2 months after the surgery), the pulling is again activated. The progress of tooth movement can be seen, comparing the lengths of the elastic elements in Figs. 21 & 22. The newly-formed healthy gingiva can also be seen around the bracket that is attached to the crown of the lower left canine (Fig. 22). In the 4th post-op visit (3 months after the surgery), the forced-eruption is again activated. This time is by using a piggyback mechanics. The progress of tooth eruption is shown in Fig. 23. Note that the crown of the tooth (lower left canine) is surrounded by healthy gingiva. The direction of the pulling force is proper (Figs. 16, 19-23). The progress of tooth eruption is complete (Fig. 24). Note that the crown of the tooth (lower left canine) is surrounded by healthy gingiva.